I got this recipe off an email list years ago. My family loves this, and it’s so easy. Stir fry onion in oil until clear, add garlic and cook briefly. Remove from pan. Stir fry chicken or beef until cooked and remove from pan. Stir fry vegetables just till crisp-tender. Add all ingredients back to wok. Add sauce, coat and stir in cooked, drained spaghetti. Notes: I like to use leftover meat for a quick and easy meal. I cook lots of chicken at once, and freeze in meal size portions. It’s perfect for this meal. This is also a great dish to use leftover meat and veggies. What a great, easy recipe. 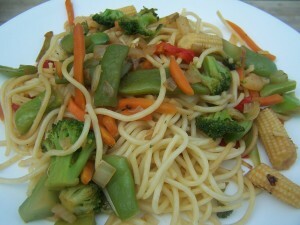 I have been thinking about making lo mein, but I thought it would be more complicated. Definitely adding this recipe to my meal plan. I just found your site today and I’m excited to follow your posts. This looks delicious! I love making my own take-out. Yummmmm! I love lo mein!